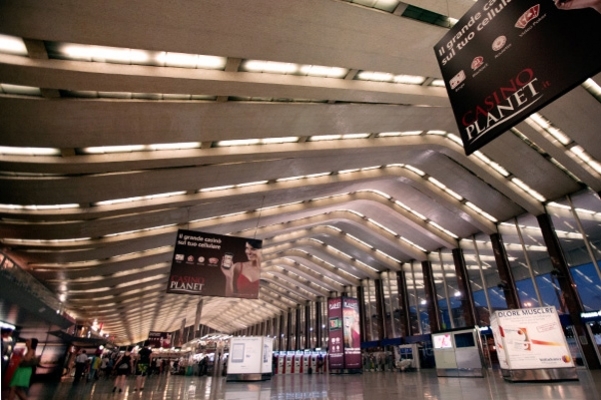 ​Roma Termini is Italy’s largest station in terms of size and traffic volume and is one of Europe’s main stations. It has been dubbed a “Constantly expanding Universe” due to the numerous alterations made to the building, which over the years has become an exclusive place, a key resource for the city, with a dual role as a multi-transport hub and city piazza, filled with services and commercial opportunities. The architect Mazzoni wanted to represent Italy by using home-hewn premium marble only. ​From the very start Stazione Termini revealed a fluid and dynamic core, a building deeply enmeshed with the city, ready to absorb the sudden historical, economic and political changes taking place in the Capital. 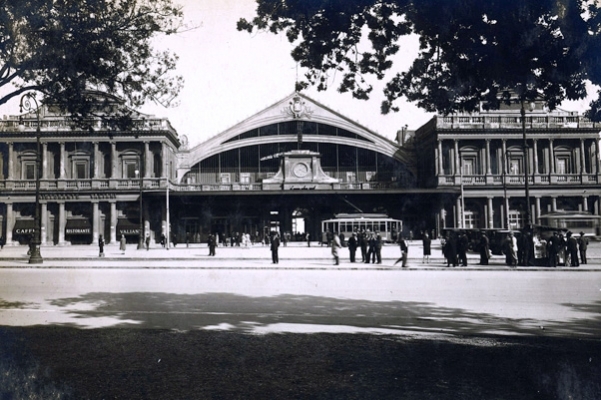 In 1867, the year it was inaugurated, Rome had just 180 thousand inhabitants, and quite a low level of commercial and railway traffic, but in the arc of just 15 years Rome’s population tripled and station expansion works started straightaway, with the addition of sheds and floors to better meet the needs of Rome’s inhabitants. ​The area where the station stands is of huge archaeological value. In fact, it sits between the Aurelian walls and the 80 metres wall of the Agger Servianus. 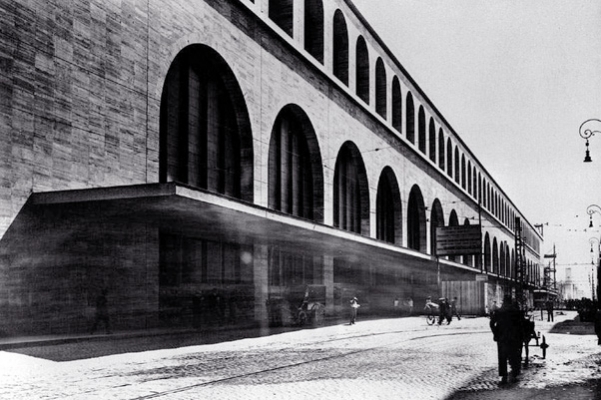 In 1925 the architect Angiolo Mazzoni was asked to study a new project to expand the old building. Mazzoni proposed various solutions for blending old style with new aesthetic taste. His design was a rare example of Futurist architecture with the addition of classically inspired forms, spacious and solemn areas, arches, vaulting and an enormous atrium conceived not as a filter between station and city, but as an “imposing entrance to a temple”. 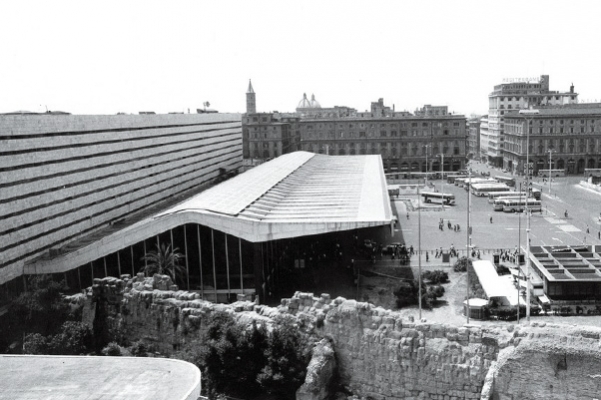 ​The ideal seamlessness between the ancient and modern art of building that characterises Stazione Termini took shape fully in 1950 when the Montuori Vitellozz group became involved. The new design was an important example of Italian Rationalism and featured clear, transparent and functional forms, in harmony with the existing building. The distinctive feature of the new station’s exterior was the long sinuous concrete platform roof, given the affectionate nickname of “the dinosaur” by the Romans. 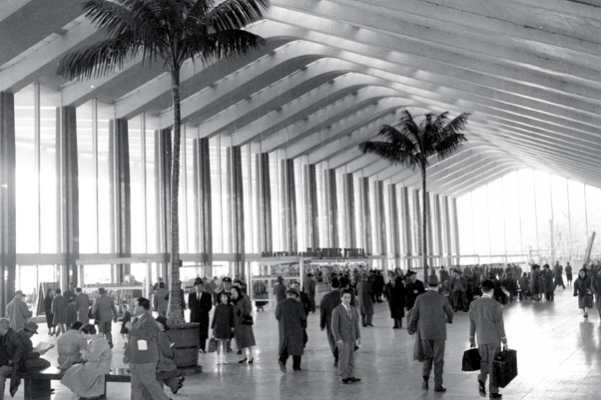 ​Roma Termini’s original architecture, a mixture of styles from the Thirties to the Fifties, has been further blended with modern-style interventions, designed by our staff in collaboration with acclaimed designers such as Atelier Mendini, Michele De Lucchi, Pierluigi Cerri, Vignelli Associates and Piero Castiglioni. ​As a result of our redesign work, the Central Gallery went from being a simple pedestrian link to a large service portal for travellers, tourists and local inhabitants, with attractive shopping outlets, restaurants and fast food eateries for every need. In recent years the station has become a multi-functional centre featuring public utilities, shopping opportunities, events, places to eat, wellness and culture, representing an important landmark for tourists and Rome’s inhabitants alike. 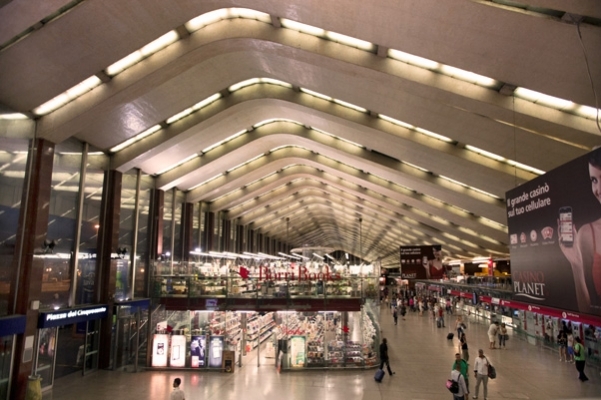 Roma Termini’s splendid spaces are very often chosen as locations for concerts, meetings, exhibitions, literary and social events, photo shoots and movie filming.On 23 December 2006 Stazione Termini was dedicated to Pope John Paul II with an official ceremony.